If there is one positive to be taken from the tyrannical and anti-Christian government policies that characterize the times we live in, it is perhaps the fact that it forces Christians to delve deeper into historical sources for enlightenment on properly reacting to evil government. When pastor Matthew Trewhella of Mercy Seat Christian Church in Milwaukee, Wisconsin, was researching the historic Christian doctrine of the lesser magistrate, he read references to the 1550 Magdeburg Confession in his sources and literature, but was unable to locate an English translation of it. The reason for this was, as he would find out, and perhaps shockingly, that this important doctrinal confession had never been translated into English.1 He combined forces with classicist scholar Dr. Matthew Colvin and Presbyterian minister Rev. 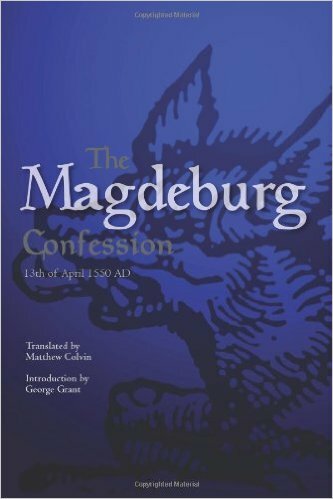 George Grant to produce and introduce a groundbreaking English translation of the Magdeburg Confession from the original Latin in 2012. Thanks to a friend, I managed to get my hands on a copy of this work and, having read it, I would like to provide my readers with a historical-theological analysis of both the context and the text of the Confession. The purpose of the Magdeburg Confession is to set forth the Christian doctrine of the lesser magistrate in resisting state tyranny. In particular, in a sixteenth-century European context, where early-Enlightenment political centralization was gaining ground, it sets forth the doctrine of the duty of the lesser magistrate with regard to resisting tyranny. It is the first known historical document to systematically exposit this Christian doctrine. Allow me to proceed to an analysis of the text of the confession itself. This section will include both excerpts from Colvin’s English translation of the confession and my own commentary. There can be no doubt that God by his kindness raised up Dr. Martin Luther as a third Elijah, in order that he might reveal in these last days (according to His published prophecies) the Man of Sin, the Son of Perdition, the Antichrist, ruling in Rome in the Temple of God; likewise, to destroy him by the Spirit of the mouth of Christ, and to rebuild the entire doctrine of his Son. . . .
And so Luther, although dead, both lives forever himself and the fruit of his work, as if it were a dead man, also lives, and shall live, and shall flourish in all ages and among still more nations. Nor shall the Antichrist ever regain his earlier strength, as Daniel, Paul, and John bear witness, howsoever much he shall try. It is noteworthy that Luther is here identified, right at the start of the confession, as “a third Elijah,” which I believe, in light of the context, to be a significant eschatological proclamation. His ministry as a third Elijah is directly connected to the eschatological victory of Christ over the Antichrist, here identified as the Pope. There can be no doubt regarding the postmillenial eschatological convictions of the authors of Magdeburg. God wants even the impious or unregenerate to be governed by an outward discipline in this civil society. . . . Just as the Anabaptists partly abolish the Law, removing civil office and judgments and the distinction between the dominions, so the papists . . . distort the Law, forbidding marriage to priests, and denying that political and economic works ought to be cultivated among believers. The Law of God is presupposed as the moral foundation for civil society and it is affirmed that God desires all of mankind to be governed by the Law of God. (Magdeburg includes even the unregenerate.) The institutions of society, explicitly including marriage, are also to conform to God’s Law, for His glory and for the benefit of mankind. Contrary to the radical two-kingdom heresy, Magdeburg recognizes no strict moral distinction between the public and private domain or the civil and ecclesiastical domain. This distinction is fundamentally a product of Enlightenment liberalism that needs to be rejected by all Christians. Just as the Church is an ordinance of God, in which God wants there to be an order of teachers and learners, so also politics and economy are truly ordinances of God, in which He likewise wants there to be an order of superiors and an order of inferiors who are ruled by laws and precepts that agree with reason and are not at variance with the Word. Two criteria are provided to which all good laws need to conform, although it would have been much better if the authors of Magdeburg had stated this in a different order to symbolize the societal implications of the trinitarian one and many (i.e. universalism and particularism) which underlies this statement. Good laws must indeed be 1) in accordance with God’s Word and 2) harmonious with the reason and spirit (Rassenseele) of the particular people being governed.
. . . just as subjects necessarily owe obedience to their magistrates; and children and the rest of the family, to their parents and masters, on account of God; so on the other hand, when magistrates or parents themselves lead their charges away from true piety and uprightness, obedience is not owed to them from the Word of God. Also, when they professedly persecute piety and uprightness, they remove themselves from the honor of magistrate and parents before God and their own consciences, and instead of being an ordinance of God they become an ordinance of the devil, which can and ought to be resisted by His order for the sake of one’s calling. The confession here directly relates the authority of the father of the household with the authority of government – with both rooted in the lordship of Christ. The modern church often wants us to believe in unconditional obedience to our overbearing government, even while advocating hundreds of unbiblical reasons for wives not to submit to their husbands. It is now all the more needful that we should prove by our Defence whether a Christian magistrate can or ought to preserve his State and the Christian teachers and hearers in it against his own superior magistrate, and drive off by force one who is using force to compel people to reject the true doctrine and true worship of God, and to accept idolatry. The heresy of pacifism is refuted here. Also note that the godly magistrate is required to preserve two things: 1) the Christian State and 2) the Christian Church. Again, we see no moral church-state division here. Church and state are to be separate and independent institutions, though both equally responsible to the moral law of God. The true Church has never taught that men ought to be forced, even to true piety, by weapons. In the same manner, you yourself allow the Jews and pagans who obey your rule to follow their own religion; you do not force them with weapons to accept yours. We poor wretches, since we are called Lutherans, are more unfortunate than these. . . . [E]xcept for the preservation of our religion, nothing else is sought; that when this is gained, our Senate and citizens will be most obedient in all their proper duties according to your Majesty’s laws. . . . We command them [church members], by the word of Christ, to render unto God the things that are God’s, and to Caesar, though he be different in religion, the things that are Caesar’s. . . . [Y]ou, Charles Caesar, are exceeding the limits of your dominion, and you are extending it into the dominion of Christ. A better wording may have been in order. After beautifully refuting the radical two-kingdom distinction elsewhere, there seems to be compromise here. Since biblical law forbids the public practice of false religions, and since the religious freedom of “Jews and pagans” to which Magdeburg appeals includes these public practices (e.g. worshiping at synagogues), the confession goes too far in arguing for the toleration of Protestantism. Such an appeal may be a pragmatic ad hominem but it is counterproductive at the very least. The Magistrate is an ordinance of God for honor to good works, and a terror to evil works. Therefore when he begins to be a terror to good works and an honor to evil, there is no longer in him, because he does this, the ordinance of God, but the ordinance of the devil. And he who resists such works, does not resist the ordinance of God, but the ordinance of the devil. But he who resists, it is necessary that he resist in his own station, as a matter of his calling. Romans 13 is here interpreted in a radically different manner than commonly done by the modern church. Obedience to government is understood to be conditional upon the government’s fulfilling its duty to uphold the Law of God. When, moreover, [the superior magistrate] deposes an inferior magistrate who is unwilling to obey him in such a crime, and replaces him with someone who is willing, by the very fact that he now honors and promotes evil works, and dishonors and destroys the good, he is no longer the ordinance of God, but the ordinance of the devil, and he makes this disposition of the good magistrate invalid before the judgment of God, and the deposed one still remains obligated to God to do the duty of a magistrate among his people – that is, to promote good works and reprove evil in whoever commits it, even his superior. The historical background to this statement is, of course, Frederick the Wise’s capture and the usurpation of his rule. This principle, that legitimate governments continue their right to rule even after usurpation, can perhaps have multigenerational implications, which would make for an interesting discussion. First then, . . .  magistrates by their natural weakness have their own vices and sins, by which either knowingly or wantonly, they sometimes do injuries, not excessively atrocious, but remediable. We do not at all wish inferior magistrates to exercise their own office against superiors with the sword in these cases, either to punish or to defend. They can also exercise their office by warning them seriously, and in other ways. . . . Here we may also make a broader application of Exodus 22[:28], ‘You shall not speak evil of a ruler of your people’. The second level is that of atrocious and notorious injuries, as when a leader from a state, or Caesar from an individual leader wishes by unjust violence, contrary to his oath and the laws, to take away life, or spouse, or children, or privilege and sovereignty acquired by inheritance or law. . . . [W]e will hope that in this circumstance Christian magistrates are prepared to suffer even injuries of this sort, and to leave vengeance to God, when the injury affects individual men, or a few men, and when the injury is able to be tolerated without sin. Here let us establish the third degree of injury to a magistrate, in which an inferior magistrate is so forced to certain sin, that he is not able to suffer it without sin if defence is omitted – for the sake of which he himself bears the sword, as when Pharaoh orders the midwives to kill the male children of the Hebrews, or if he were to order Moses to aid in the persecution of the Israelites. The fourth and highest level of injury by superiors is more than tyrannical. It is when tyrants begin to be so mad that they persecute with guile and arms, not so much the just persons of inferior magistrates and their subjects, as the right itself, especially the right of anyone of the highest and most necessary rank; and that they persecute God, the author of right in persons, not by any sudden or momentary fury, but with deliberate and persistent attempt to destroy good works for the posterity. . . . Therefore, if now the leader or Caesar proceeds to such a height of insanity only in that order of natural knowledge which governs the society of civil life and uprightness, that he abolishes the law concerning marriages and all chastity, and himself sets up a contrary law of roving unclean lusts, to the effect that the wives and daughters of all men are to be prostituted; and if he himself defends and prosecutes this law with force and arms, so that certain death is laid down as the penalty of those who resist or fail to conform – in such a case, doubtless, no clear-thinking person would have any hesitation about the divine right and commandment that such a leader or monarch ought to be curbed by everyone in his most wicked attempt, even by the lowest magistrates with whatever power they have. One really has to question the distinction between the second and third level of tyranny that Magdeburg makes. While in principle we understand the occasional propriety of a lesser magistrate’s refraining from forcefully opposing just any injury which a tyrant commits (and in which he does not require the lesser’s participation), it seems extreme to suppose that “tak[ing] away life, or spouse, or children” is a circumstance where ordinarily “injury is able to be tolerated without sin.” The Westminster Larger Catechism (question #135), discussing the sixth commandment, requires the preservation of others’ lives “by just defence thereof against violence,” which would push more towards violent resistance for tyrants who would murder men or steal their wives and children from them. Nevertheless, we can understand the principled distinction behind the second and third levels, and Magdeburg’s distinction among the levels is otherwise quite useful. Additionally, when Magdeburg speaks of the “lowest magistrates” in resisting fourth-level tyrants, though it likely intends this to include only the lowest political authorities in a state (e.g. some city councilman), I would hold, due to the rooting of the state in the patriarchal family, that this would further extend to fathers, to heads of household, as invested with conditional political authority to take action against tyrants in the event that lesser magistrates fail to do so. God forbid, but in the absence of a godly head of household, wives and mothers may even take over magisterial duties in this sense. By refusing obedience to superiors in these things which are contrary to God, they do not violate the majesty of their superiors, nor can they be judged obstinate or rebellious . . . because those who wield the magistracy do not demand this obedience as magistrates by the ordinance of God, but as men, that is, having no superiority from the word of God. . . . [D]ivine laws necessarily trump human ones. Christ, by this same sentence (‘Render unto Caesar the things that are Caesar’s, and to God the things that are God’s’), as He subjects other men to Caesar, so He also subjects both them and Caesar himself to God, and He wishes the greatest power among men, as it is the power of Caesar, to be especially subservient to God, by taking care that just as Caesar himself, so also the rest of the subjects under his power, should render to God the things that are God’s, according to his Word, and should restrain those who do otherwise. There can be no doubt regarding the theonomic convictions of the authors of Magdeburg. Therefore, when the highest prince himself not only does not render to God the things that are God’s, but also snatches divine honor from others on the pretext of his power, and claims it for himself by the sword, then there nonetheless remains among men this very power ordained by God, to vindicate the honor of God. The doctrine of the lesser magistrate is fundamentally rooted in the doctrine of divine providence, which Calvin and the Reformed confessions teach us to be an expression of God’s Fatherly love. The lesser magistrate, whoever he may be at any given time, is a gift from God our Father, for both the protection of His elect and the advancement of His Kingdom on earth. God sometimes . . . punishes the wicked themselves by means of the wicked; but ordinarily He does so through those who are called to exercise just punishment, according to what is said about homicides: ‘Whosoever shed’s man’s blood, by man shall his blood be shed’ (Gen. 9). . . . Therefore when a magistrate suppresses a tyrant, it is apparent that the same is suppressed by God. Here Magdeburg already starts the build-up to the third and final part of the confession, the exhortation, which relates to the duties of all Christians in difficult times of government tyranny. Resistance is a duty, a calling from God, which all Christians need to obey or else face God’s judgment. We ought to obey and fear God more than man. It is obvious that no pious or Christian person can bring aid to our enemies either by military means, or by giving plans, money or other things by which our enemies are armed. . . . Therefore, whether you be a magistrate or a subject in any way involved in this war or in the carrying out of proscription, consider to what you are lending your counsel, money, work, body, and even your very life and soul; and to what allies. Is it not to the enemies of Christ and His word? Christians need to seriously consider what their tax money is being used for and, as far as possible, work for tax reform and resist unjust taxes. Working for godless governments is then also justified to the Christian only if he uses his office and authority as a means to resist tyranny. If [we are] not able to escape without punishment, [we] may rather flee or suffer or even employ the defence of inferior magistrates that is granted against unjust violence by divine law as well as by natural and human law, and especially by the prerogative of our German Empire, according to which superiors and inferiors are mutually bound by certain laws and privileges. Christians can use these things rightly and with good conscience, just like all other political ordinances that are not at odds with the Word of God. Here again we see the one-and-many paradigm upon which the doctrine of Kinism is based. While all forms of government are to be founded upon God’s Law, forms of government and common law adapt culturally to the particular people being governed and would differ radically as Christianity sanctifies different nations. It is lawful for Christians to appeal to and utilize and support the common and cultural laws of their particular people, as long as it remains in accordance with God’s revealed Law in Scripture. We now come to . . . the duty of pious men, about which God has instructed us in Proverbs 24[:11], saying ‘Rescue those who are being led to death and do not refrain from freeing those who are being dragged to destruction’. This discourse now warns Christians of two things: First, that it is not enough not to strive along with the impious against us, but that one ought to also be of aid to us, lest we be overwhelmed unjustly. . . . In the second place, this discourse warns Christians that those reasons to desert us which they are now inventing for themselves are not at all satisfying to God, that He should not hold them guilty of our blood and the blood of Christ, for whose sake we are suffering this persecution. Any and all attempts by the church at ‘neutrality’ in the public domain are cowardly, sinful endeavors. But the duties of this sort to which other pious persons are obliged to for the assistance of this city . . . are the following:  First is intercession according to that verse of James 5: ‘Pray for each other’. . . . The second duty is supplication with our superiors. . . The third duty of Christians . . . is to put forth the same effort at preserving Christ as the enemies are making at destroying Christ. Those who are able also owe us that faithfulness which Jonathan and Hushai showed to David when he was suffering injustices from king Saul and from his son Absalom (I Samuel 20; II Samuel 17). It is striking that Magdeburg would call Christians to exert the same effort in resisting tyrants that tyrants use to suppress Christians, given the temptation most Christians (at that time as well as now) would surely have to rationalize passivity as righteous in their circumstances. We have a sure promise from Him that our labor that is undertaken according to His Word will not be in vain, but will bear some fruit. Indeed, it is certain that Christ is with the Church, and that He will defend Her to the end even against all the gates of hell. The Magdeburg Confession provides one of the most systematic and extensive outlines of the doctrine of Christian resistance to tyranny that I have ever come across. It is as relevant and vital for the Church militant today as ever. The persecution which Christ’s Church in the West currently suffers under our tyrannical government policies naturally looks somewhat different from that of sixteenth-century Germany, but the fighting spirit and the principled actions of the people of Magdeburg are no less necessary. I hope that the increased accessibility of the confession and the consequent knowledge of the truths concerning these vital doctrines can inspire the flock of Christ, by the grace of God, to conquer the same evil in our own age once again.